Proceedings of the Second International Pharmacological Meeting, Volume 1: Pharmacology of Conditioning, Learning and Retention is a collection of papers presented at the Second International Pharmacological Meeting on August 20-23, 1963. This book is organized into two sections encompassing 28 chapters. The first section defines the main problem in psychopharmacology, which is the establishment of methods that will enable to appreciate in animals the value of psychotropic drugs in the therapy of human mental diseases. This section also describes the specific activation of the central nervous system and its significance in psychopharmacological research. 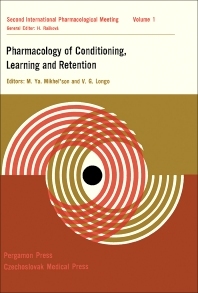 The second section explores the electrophysiological phenomena observed during pharmacological conditioning, with emphasis on the modifications of electrical activity during the establishment and the performance of the conditioned responses. This section also deals with the electrical correlated of various kinds of conditioned behavior in animals and the alterations of spontaneous rhythm and evoked potentials. This book is of value to psychopharmacologists and electrophysiologists.